Deborah Hogan, PhD, a professor of microbiology and immunology at Dartmouth’s Geisel School of Medicine, has been named a 2019 Fellow of the American Academy of Microbiology (AAM). Fellows of the AAM, an honorific leadership group within the American Society for Microbiology, are elected annually through a highly selective, peer-review process—based on their records of scientific achievement and original contributions advancing the field of microbiology. Specific election qualifiers include: scientific excellence, originality, leadership, high ethical standards, and scholarly and creative achievement. With the 109 new Fellows named in January, the AAM now has more than 2,400 Fellows from around the globe who represent all subspecialties of the microbial sciences and work in basic and applied research, teaching, public health, industry, and government service. "I felt very honored by this recognition by peers in the field of microbiology," says Hogan. "My induction into the AAM is the result of the collaborative talents of the amazingly smart and innovative graduate students, post-docs, research scientists, and undergraduates who I have worked with in the lab, and our interactions with the great scientific community at Dartmouth." 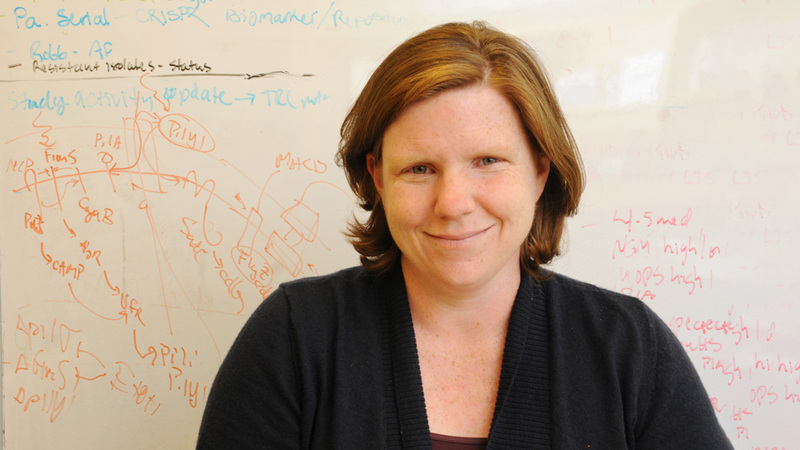 Hogan joined the Dartmouth faculty in 2004, focusing her research on revealing new metabolic pathways that control the biology of chronic bacterial and bacterial-fungal interactions and hold promise for treating airway infections in cystic fibrosis (CF). Through this work, she was able to secure substantial grant funding from the CF Foundation and the National Institutes of Health (NIH) as an independent researcher. Today, the Hogan Lab is a recognized leader in studying microbial interactions in mixed species chronic infections. She has now published 80 research papers and has received more than $6 million in grant funding over the past 15 years. "Suffice it to say, I think Deb is a superb scientist and mentor who has made numerous contributions to the department and to Dartmouth," says David Leib, PhD, professor and chair of the Department of Microbiology and Immunology at Geisel. "I cannot think of anyone more richly deserving of this award." Hogan co-directs the Lung Biology COBRE (Centers of Biomedical Research Excellence) Translational Research Core at Dartmouth, and also serves as an associate editor for the journal PLoS Pathogens. She was the recipient of the Dartmouth Graduate Faculty Mentoring Award in 2014. Hogan received national recognition in 2016 as a recipient of the Dr. Thomas Maciag COBRE Independence Award from the NIH.